Harvest honey if available (& hopefully extract before it gets too cold; remember the saying about molasses in January). End of season mite check (and treatment if needed). If you still need to treat, Oxalic acid is effective during broodless periods and can still be applied. See Honey Bee Health for details on mite evaluation and treatment. You’ve determined the weak hives by evaluating both population and stores. You’ve helped out the weakest hives, from the point of view of stores by borrowing (stealing) a frame or two of honey and pollen from a very strong hive. For those that are low on population you’ve combined with another hive. Continue feeding with heavy (2:1 or 3:1) syrup, if they aren’t yet chockablock full. Many people will add a pollen or substitute patty for use during the winter. 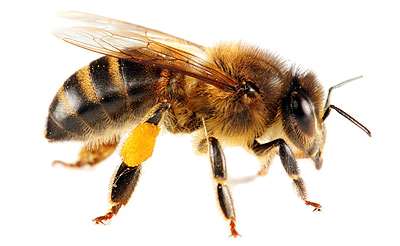 As winter is imminent, make sure you aren’t inviting robbing of weaker hives by hiding the feeders and keeping each hive closed as much as possible. Unless absolutely necessary (mite check, queen check on a week hive etc.) it isn’t a good idea to tear it apart this time of year. They’ve already established their winter configuration and started sealing up the cracks. However, I generally like to do one quick inspection and look under the inner cover and between the hive bodies to see which hives are having issues and hence will need more TLC in late winter and early spring. I do not wrap my hives, but for those who do: the last week or so of October is a good time to get it done. You want to wait until the warm weather is past. Make sure there is still plenty of ventilation as there can be quite a bit of condensation which can both drip back on the bees, and also cause mold. Some people have a ¾ inch hole toward the upper back of the upper hive body. Others keep a spacer between the inner cover and the telescoping cover. Another possibility is to add a spacer type super with ventilation holes and some muffling substance such as wood shavings or burlap to reduce strong drafts. Also, as the bees cluster in the winter and cannot move around to defend the hive it’s a good idea to add either an entrance reducer or a mouse guard. Some others also will add a wind break (hay bales etc.) to the northwest to slow down the winter wind. Lastly, put a rock or strap to hold down the top cover as we have lots of wind here in Central Oregon. Not something for you to do, but an interesting part of honey bee biology this time of year is observing the drones getting evicted. They are dragged out, “kicking and screaming”. They’ll then hang out around the entrance, or on the sunny side of the hive. It’s an interesting feeling letting them stay out and die, however it’s a good demonstration that for honey bees, the good of the hive is of a much greater importance than the survival of an individual. Enjoy our wonderful and changeable Autumn weather. Many thanks to Allen Engle for these October notes! !